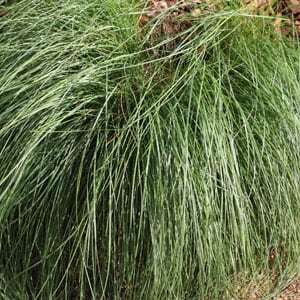 A low maintenance native grass, Poa labillardieri is widely used as a feature grass as well as for mass planting. It is excellent along fencelines and is often found in found in roadside plantings and around commercial buildings. It is also useful for planting beneath trees, including Eucalypts. For mass plantings, space at around 50 cm. This a reasonably drought tolerant plant as long as it gets adequate water during winter. P. labillardieri ‘Eskdale’ is reported to more drought tolerant. Once planted, the temptation is to substitute low maintenance with no maintenance, and this is where Poa labillardieri needs a little explanation. For the first 2 – 3 years it does not require much care to be kept looking good. After 2 – 3 years it develops a percentage of old dead foliage, like most other grasses. This need to be removed. Simply cut the clump right back to the ground in late winter every year or every second year. Rake away the old foliage and the new green growth will quickly reestablish a beautiful clump. Flowers – Feathery plumes in summer. Foliage – Mid green with a natural slight weeping habit. Poa labillardieri is available for sale from the following nurseries.